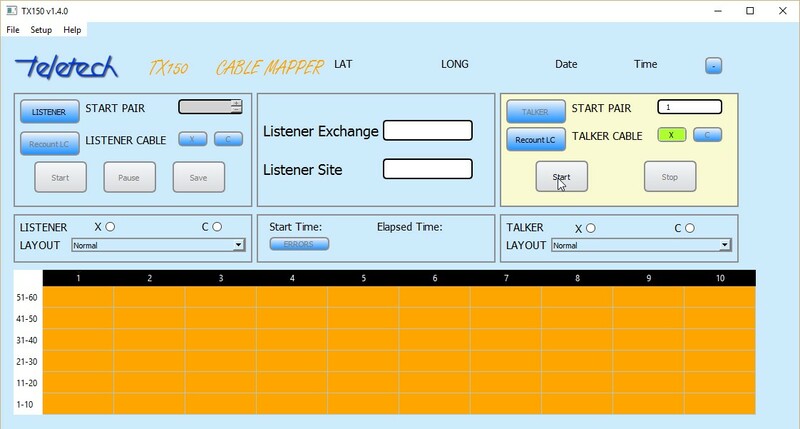 Mapping and verification of External plant network records (mapping cables and pair records against telephone services). Also close-out testing and compliance to field processes. 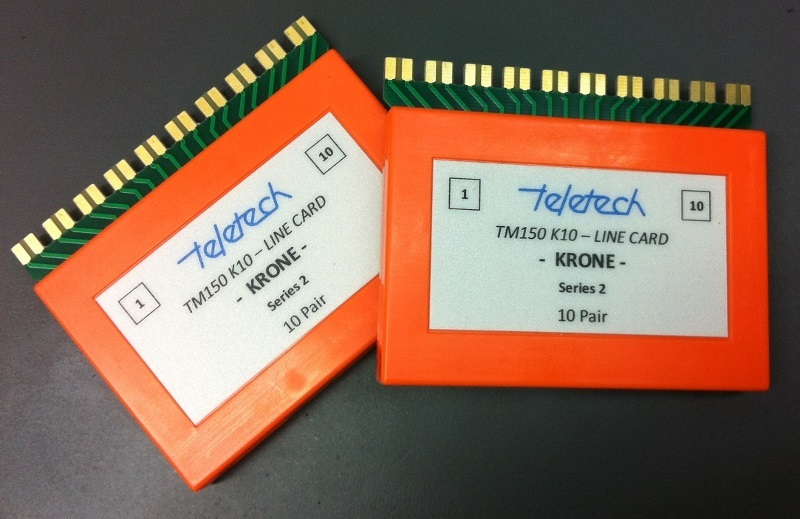 The TX150 Kit is made up of a TU150 controller kit and TM150 Line Cards. 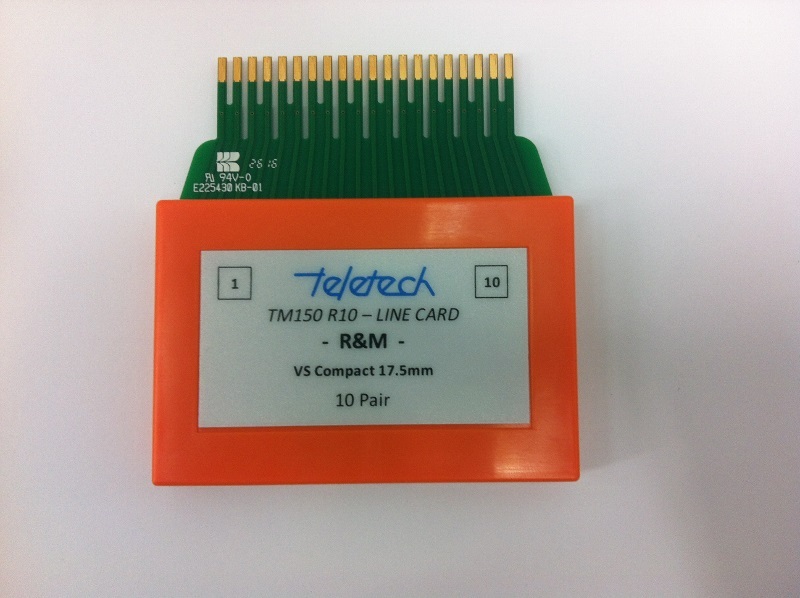 The customer can decide what Line Cards will suit their testing and buy them to build up a kit of TX150. 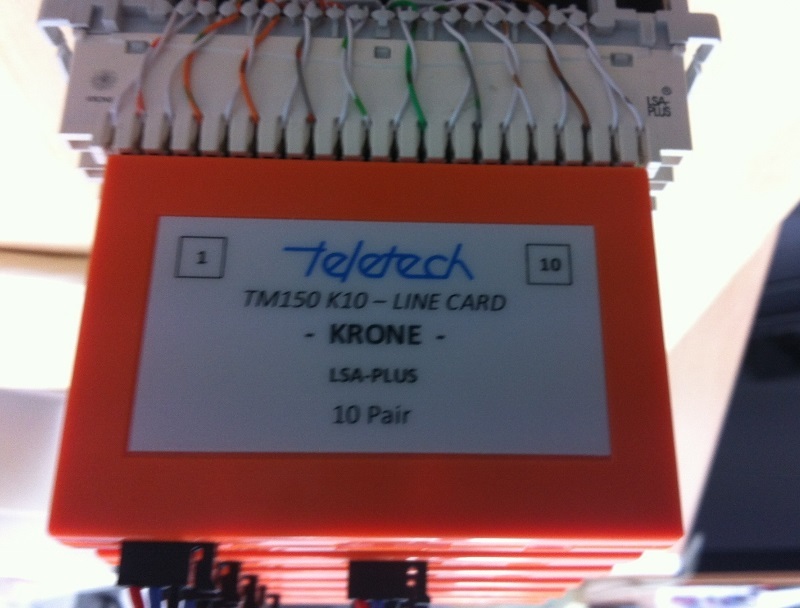 The TX150 is designed to check cable terminations between each end of a multi-pair cable. 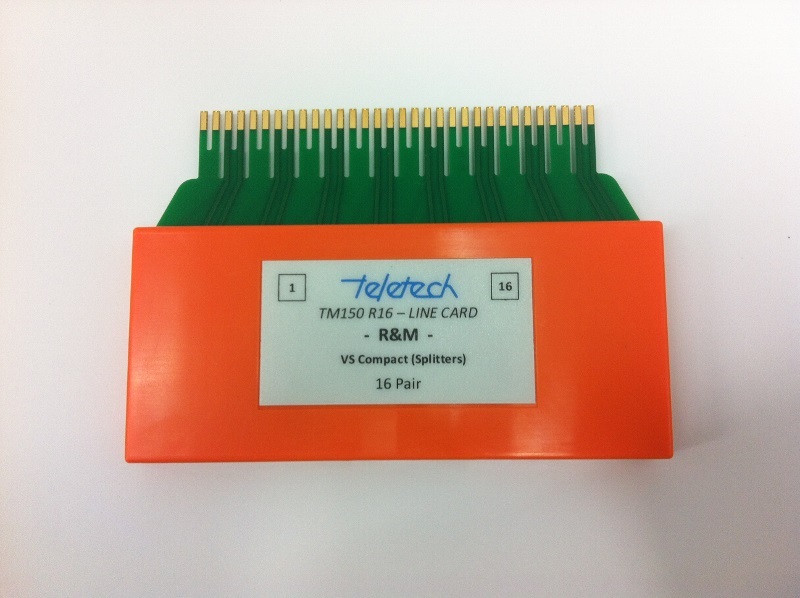 Line Cards are plugged into the terminating blocks at each end. 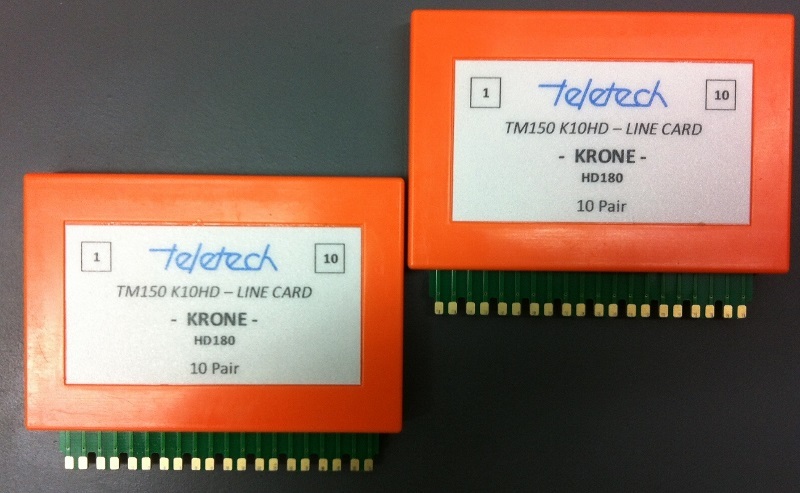 At each end the Line Cards are joined together with Link Cables and the first Line Card at each end is connected to a Controller (TU150). The Controller and Line Cards are t each end powered by a separate battery. One end is designated the Talker and the other end is designated the Listener. The Talker end sends signals on each pair of the cable and the Listener end identifies these signals. All signals are transmitted simultaneously so identification of pairs is very quick (less than 10 seconds). The installer for TX150v1.5.0 with updated libraries. The instruction manual on how to use the TX150. The CRU is at the heart of the TELSYS system. The CRU consists of tests heads and computer servers. •	Prequalification for Broadband (triple play services). 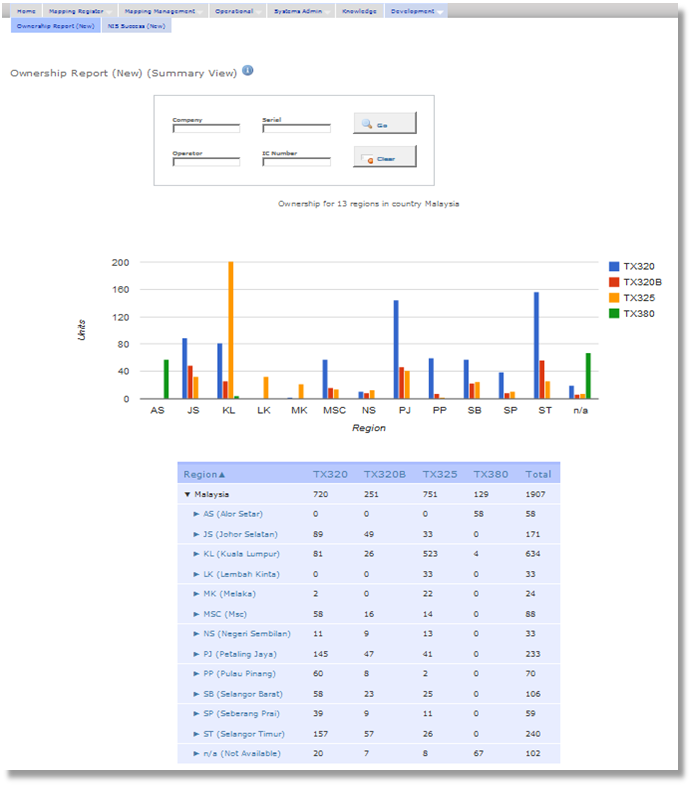 TELSYS is the reporting window of the various field instruments. The field instruments that interface and upload data and testing information are the TX380 and TX325/320B and TX320. 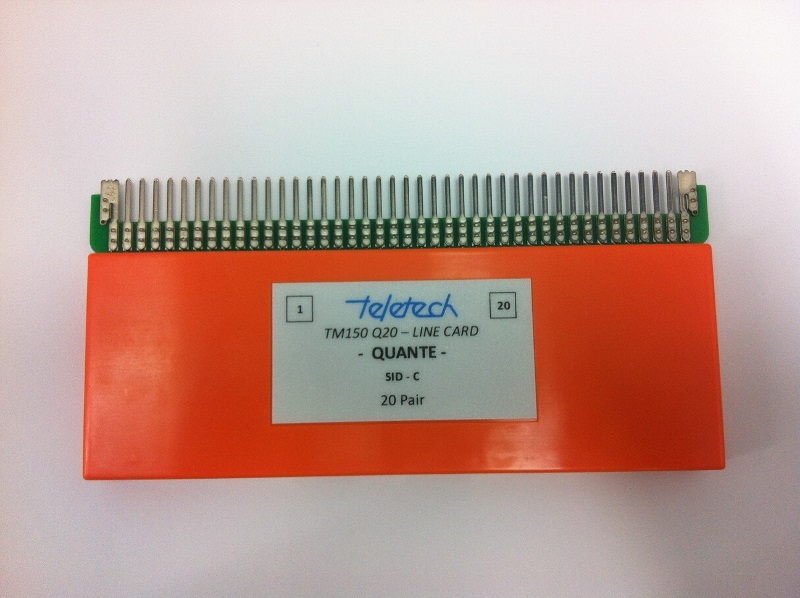 Teletech has been particularly successful with external plant (Customer Area Network (CAN)) documentation projects. Plant documentation projects involve completely documenting the condition of the copper cable. •	Change over to new OSS systems (pre-cleanse the cutover data). TELSYS suits telecommunication providers wanting to update their copper cable records. The ROI for cable plant record verification can be very high. The plant documentation projects can be one-off activity, such as, introducing new networks or on-going up-keep of the plant records. Either way, the TELSYS system can deliver the return. When commissioning new exchange equipment, TELSYS , TX380s and multiplexers can be used to map the MDF before and after cutover to both eliminate error and dramatically reduce the time taken to maintain the exchange records. 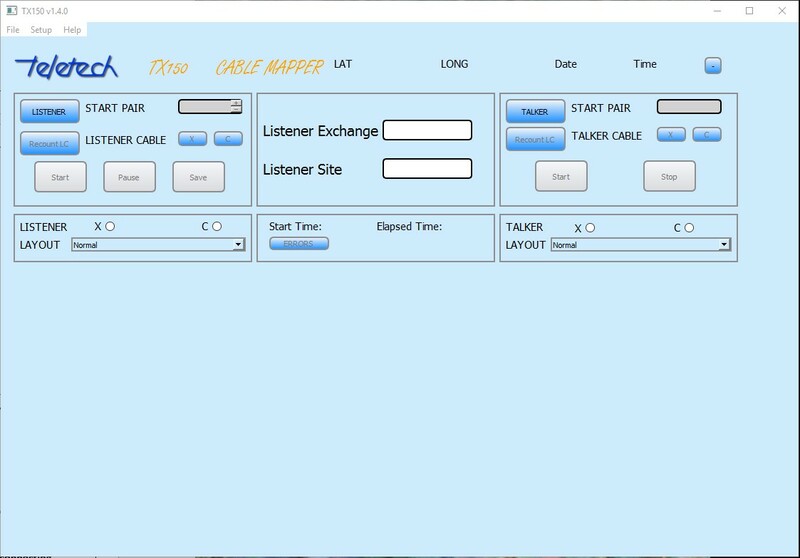 The test results are uploaded for each pair at the exchange and can be automatically compared to the existing cable record system’s data. Each working telephone line can therefore be accounted for and their location verified before and after cut-over. This type of system is both quicker and more accurate than manual checking. Reduce truck-rolls (rework on maintenance dispatches)A large telco was concerned that the trouble rate (dispatches per 1000 pairs) was too high. It was determined that part of the problem was too many additional re-reported faults dispatched to the field (re-rolls) creating unnecessary field technician dispatches and reduced customer service quality. Teletech worked with the telco to introduce a centralized test system (CRU), field test equipment and web-based management system that tracked and reported compliance to the required job close out processes. This enabled management to enforce the required testing processes and track improvements in the re-roll metrics. 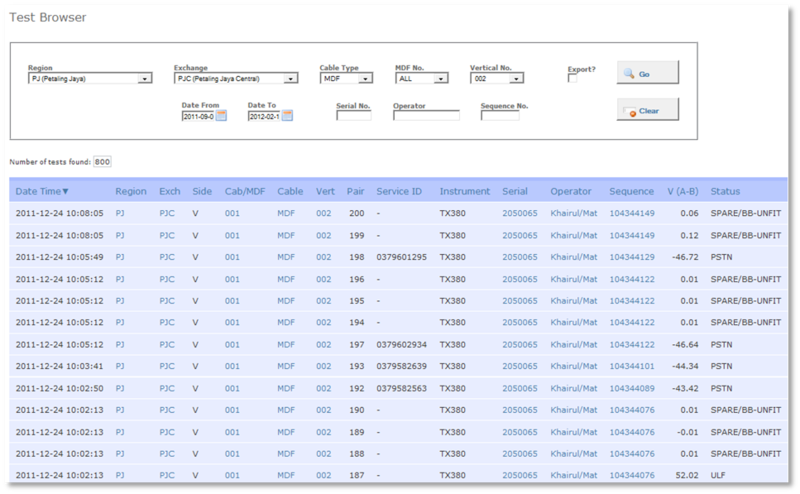 The system also provides a detailed fault history on each fault dispatch. This proved invaluable and has become an integral part of the escalated fault technician’s tool kit for resolving difficult service issues. 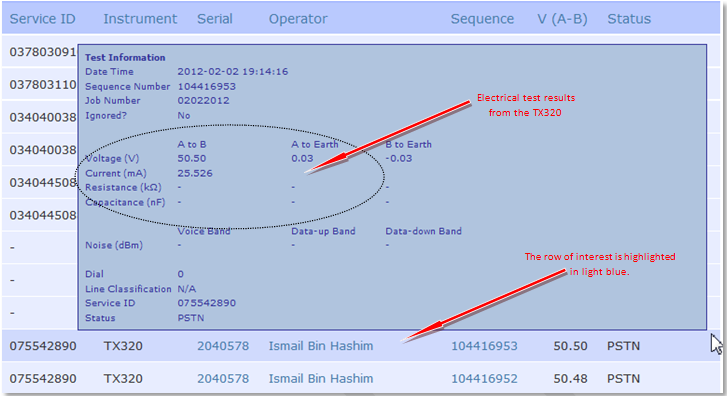 A major South East Asian telco recognised they had a problem with the accuracy of their cable records. The industry standard for the MDF or Exchange (E) side of the cross connect cabinet is approximately 1 to 5% error rate in the primary cable. The standard for the distribution (D) side (the cable from the cabinet to the customer) is approximately 5 to 10% error rate. The telco was finding error rates of >30% in some areas. 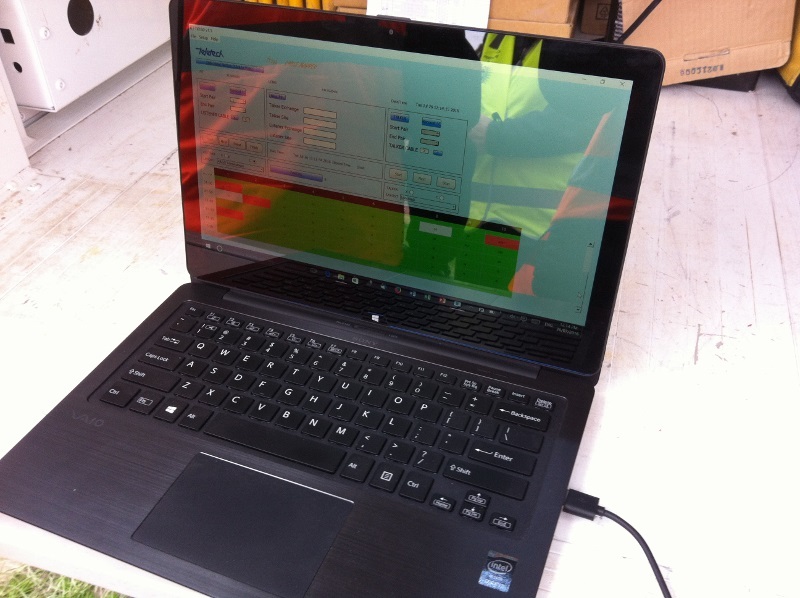 In conjunction with a plant documentation projects the introduction of TX325 instruments and associated centralised test system allowed the telco to automate the update of external plant records and significantly improve the accuracy. There were others bonuses, the telco also obtained information on the broadband quality of the installed or repaired services and used this for revenue generation purposes and the automation of the cable record changes allowed back-office cost savings. TELSYS has some distinct advantages over traditional mapping methodologies. Compared to manual mapping the system has proven to be more accurate and quicker. Using a manual methodology involves clipping onto each pair, dialing a CLI number and writing down a phone number on a piece of paper. This very laborious ‘Tick and Flick’ process is very prone to translation and transcription errors. As an operator become more fatigued or bored the risk they miss hear the phone number, write down a transposed number increase. If the paper records need to be converted to into an electronic record, more error creeps either from miss-keying and/or miss-reading the handwritten records. Because TELSYS collects the phone numbers automatically from the multiplexer connectors none of these root error causes are present. The accuracy of TELSYS mapping is further enhanced by using a systemic approach to auditing of the mapping effort. Management can know with mathematical certainty the mapping has been accurately performed. Another disadvantage of manual collection is that it is quite slow. The speed of mapping is limited by the speed of each operator. This can be solved in part be employing a large workforce of operators. However, at cabinets and exchange MDFs there is a limited amount of space available. In contract, a very small team of operators using TX380s and multiplexers can map large numbers of pairs simultaneously. 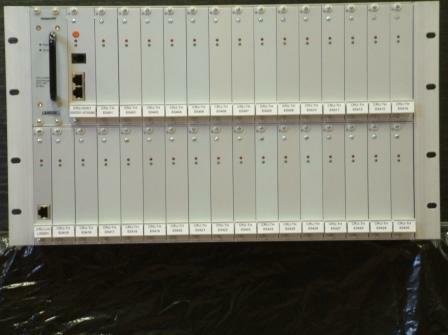 Multiplexers can be connected to hundreds of pairs at a cabinet or MDF. If desired it is possible to connect all pairs on a side of a cabinet to Multiplexers. With this configuration the TX380 testing and mapping of the cabinet would take under two hours. Manually collecting cable pair information does not practically allow the collection of information on the cables other than the existence or non-existence of a phone service. It may be possible to use test instruments such as multi-meters to test pairs, however, besides slowing the mapping process it also is very limited in the information able to be collected. Using Tx380s on the other hand automates the collection of test information about all pairs. In particular, the broadband capabilities of the pairs are assessed. The test data is stored and reported. Allowing a telco to have the dual benefits of accurate records and identified broadband capacity. There are some other non-manual cable/pair mapping systems beside TELSYS. These systems employ a different methodology from TELSYS to collect their data. TELSYS was designed with access and transportability in mind. The result is that the field instrument (TX380) is very transportable and operates with rechargeable AA batteries. Most of the real processing power of the system is centrally located. In contract, other mapping systems have bulky equipment requiring vans or large vehicles to transport. They also require separate power sources to operate. These are addition and possibly hidden costs that the use of TELSYS avoids. Easy of transportation also has another intended benefit, it makes for speeder mapping. An individual can comfortable carry enough TX380s and multiplexers to concurrently map a thousand pairs. The equivalent equipment used for other mapping systems would require several vans. 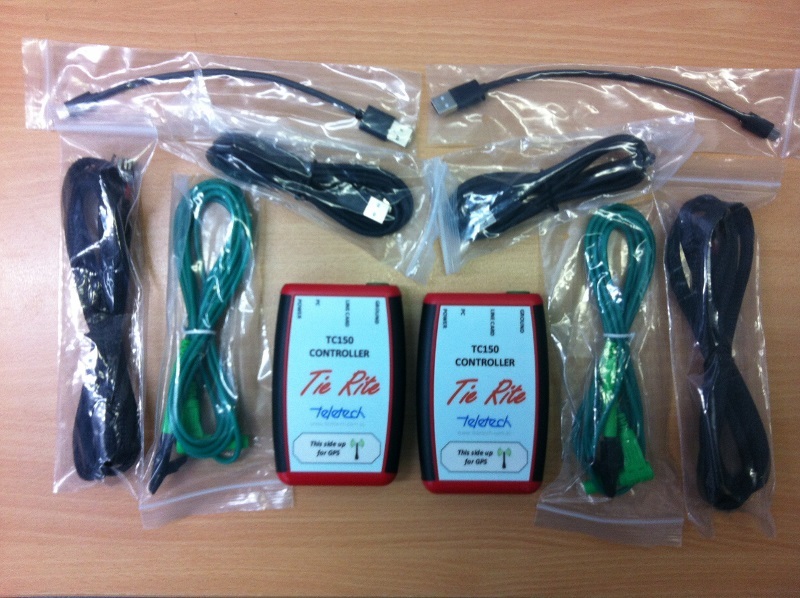 The TX380s and multiplexers are very easy and simple to operate. The cost is very low to train operators to be competent in the use of the equipment. The level of training and equipment is in some respects dependent on the outcome the telecommunication company is seeking. If the cabinets require rehabilitation this will require more skilful operators with extra tools, for example to remove old jumper wire and punch down wires. Circumstances vary between telcos and this level of work may not be required. • Central database and webserver. • Sub-Distribution Frame (SDF) and/or DPs. 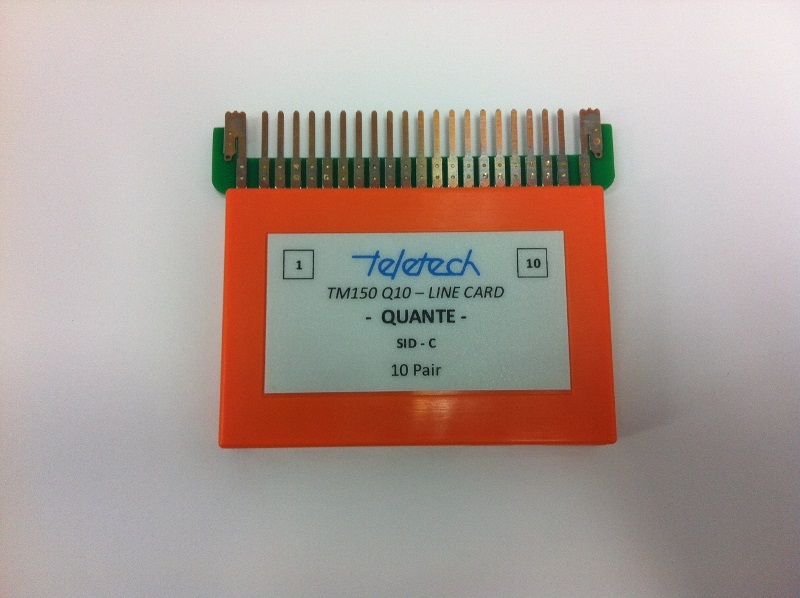 The TX325 is a product developed specifically for telecommunications companies to improve operational efficiency. It provides the functionality to upload test results into a database for permanent storage and retrieval. 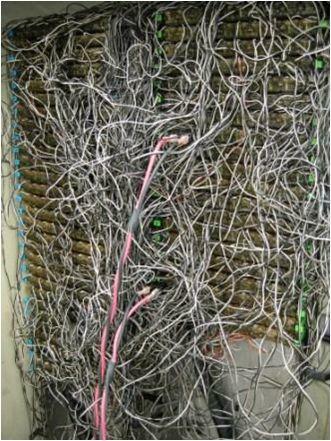 Telephone companies are fairly unique in having a large buried copper network serviced by a large mobile field workforce. The quality of the installation and service activity significantly impacts on the maintenance costs. The quality issues become more critical if/when external contractors are employed in the field workforce. The TX325 provides an opportunity for telephone companies to control the field quality and at the same time rationalise back office functions. •	Uniformity to operational processes – trouble handling procedures. Significant opportunities exist for improving a telecom company’s efficiency in operations – that is, the area that manages and maintains the external plant network (also known as the Customer Area Network CAN). Operations is where the business of installing and maintaining services happens. Operations areas typically generate little revenue but they consume a large proportion of expenses, in the order of 60% of the total budget. •	VF and Broadband Noise. Teletech’s TX380 is a hand held test instrument designed to map, test and verify telecommunication cable records. 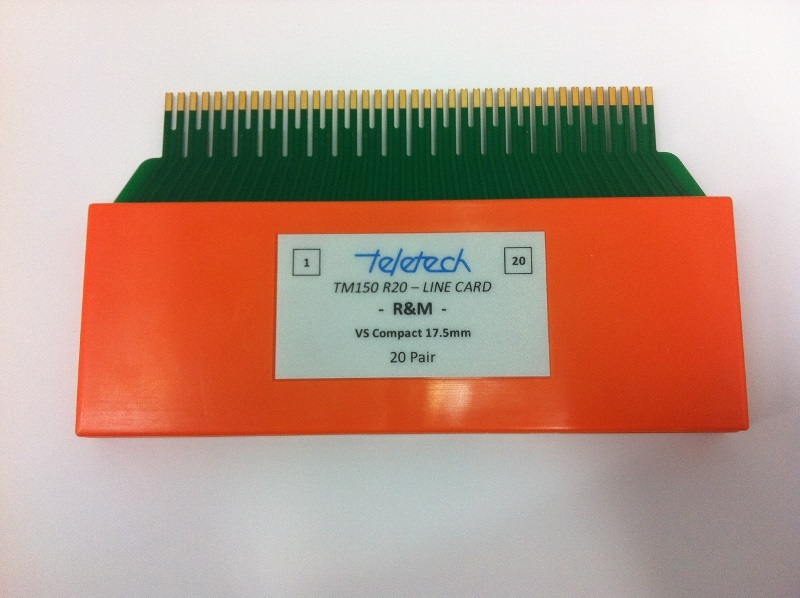 It can be used at exchange MDFs, SDF or cross-connect cabinets. 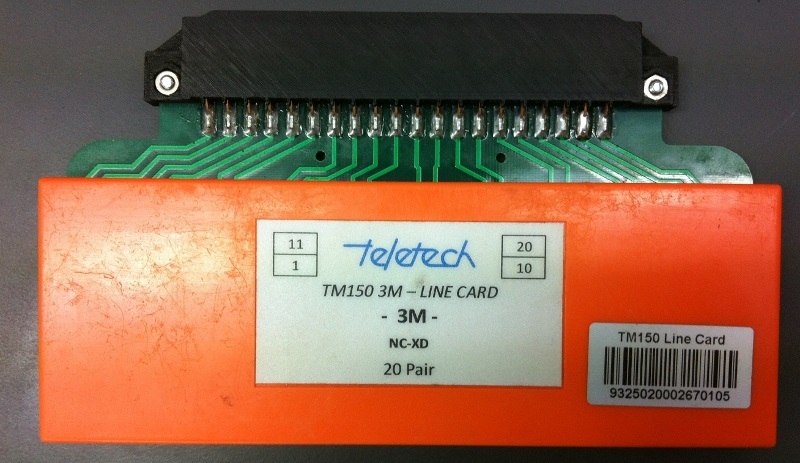 The TX380 operate with the TELSYS system. The system of TELSYS, CRU and TX380s is designed to enable ‘full’ mapping of the cable network. •	Quicker, easier and more accurate mapping than traditional methods. The TX380 can perform noise tests to check the suitability of a pair for Broadband services. It is possible to estimate the Broadband attenuation and Signal to Noise Ratio and calculate the ADSL upload and download speeds.